We are here to Help you. Dell HP IBM Workstations. Dell HP IBM Servers. HP Proliant DL380 G5. HP Proliant DL380 G4. HP Proliant DL360 G5. HP Proliant DL380 G6. HP Proliant DL380 G7. HP Proliant DL360 G6. HP Proliant DL360 G7. IBM System X range. IBM System x3650 M2. IBM System x3650 M3. IBM System x3550 M2. Server & Workstation Memory. Fibre Channel HBA Cards. 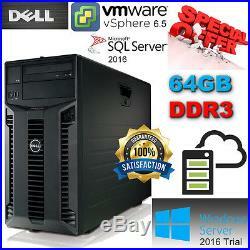 Dell PowerEdge T410 2x Six CORE X5650 2.66Ghz 64GB DDR3 4x500GB SATA 7.2K Perc 6/i raid – 12-CORES. Our certified technicians perform critical operations on each system before leaving our facility. Set up the BIOS & Update the drivers. Build an array (if applicable). Install the operating system (if applicable) and run diagnostics. Add to Watch List. Technical Introduction & Specifications. 2 x Intel Xeon X5650 Six Core 2.66 GHz processor (12 Cores Total). 4 x 500GB 3.5 SATA 7.2K Enterprise (upgrade possible). 64GB DDR3 RAM (48GB, 96GB & 128GB Available). PERC Perc 6/i Integrated RAID Controller with 256MB battery backed cache. 2x Power Supplies 580W included. Embedded Dual-port Broadcom® NetXtreme II 5716 Gigabit Ethernet. Dell iDRAC6 Enterprise Baseboard Management Controller. X6 way Backplane for up to 6 x 3.5 hot plug drives. Windows Server 2016 180-day Free Trial Version. Software Media or Licenses Not Included. Front Metal Bezel/Cover included. Choose Other 24 Hour Courier. We will then send your item via DPD – a service with numerous advantages. No need to stay in all day! Follow My Parcel service lets you see where the driver is and get a final 15 minute time-slot. Choose Other 48 Hour Courier. We deliver to all EU countries and also to Australia. Most larger items are delivered by DPD. This is a fully tracked service. You will be able to track the parcel online at all stages of its journey. Other EU countries take slightly longer. Deliveries to Denmark, Italy, Portugal, Spain and Sweden use a different courier or we can use DPD. Add all the items you want to your basket 2. If you order and pay for items separately, we are unable to apply carriage discounts. How much can you save? How will I know when my order has been dispatched? How long will it take for me to get my order? What do I do if I have not received my order when expected? Please note that couriers can deliver up until 7pm. If there is still a problem, please call 0203 129 5799 What if there is an item missing or damaged? Some orders may be dispatched from different warehouses to be with you as soon as possible. If you have an item missing from your order or damaged please call 0203 129 5799. If the time is not convenient, you can reply to choose a different day. If you are unavailable, the courier should leave a calling card and take the parcel back to your local depot. Alternatively, you can collect the parcel from your local depot. Simply stick this on your parcel and take it to your nearest Post Office. For larger items, we can arrange a DPD courier to collect the item from your address. For faulty or incorrectly described items, we provide the above service free of charge. If you change your mind and want to return an item, we can provide the above service for a small charge. The item “Dell PowerEdge T410 2x Six Core X5650 2.66Ghz 64GB DDR3 4x500GB SATA 7.2K Perc6i” is in sale since Sunday, April 15, 2018. This item is in the category “Computers/Tablets & Networking\Enterprise Networking, Servers\Servers, Clients & Terminals\Computer Servers”. The seller is “servershopping” and is located in Ealing, London. This item can be shipped worldwide. 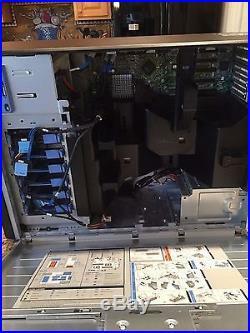 This entry was posted in dell and tagged 266ghz, 4x500gb, 64gb, core, ddr3, dell, perc6i, poweredge, sata, t410, x5650. Bookmark the permalink.